The first astraria were mechanical devices. Archimedes is said to have used a primitive version that could predict the positions of the sun, the moon, and the planets. On May 17, 1902 an archeologist named Spyridon Stais discovered a lump of oxidized material with in it a mechanism with cogwheels in a shipwreck near Antikytherasun. 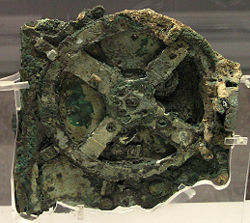 This mechanism, known as the , was dated 82 B.C. Extensive study of the fragments, using X-rays, have revealed enough details (gears, pinions, crank) pic.1 to enable researchers to build partial replicas pic 2, pic.3 , pic.4. Engraved on the major gears are the names of the planets (such as Venus), which leaves little doubt as to the intended use of the mechanism. However, before the end of the Roman Empire, the know-how and science behind this astounding piece of clockwork would be lost. The first documented astrarium clock was completed in 1364 by Giovanni de Dondi (1318-1389), a scholar and physician of the Middle Ages interested in astronomy and horology. The original clock, consisting of 107 wheels and pinions, was lost, perhaps during the sacking of Mantua in 1630, but de'Dondi left detailed descriptions which have survived, enabling the reconstruction of the clock. It displays the mean time, sidereal, or star, time and the motions of the sun, moon and the five then known planets Venus, Mars, Saturn, Mercury|Mercury, and Jupiter. It was conceived according to a Ptolemaic conception of the solar system. 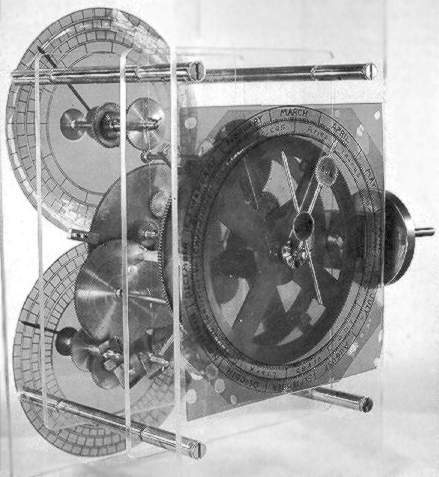 De'Dondi was inspired by his father Jacopo who had designed the astronomical clock in the Piazzi dei Signori, Padua in 1344 - one of the first of its type. Giovanni de Dondi - "Tractatus astarii"